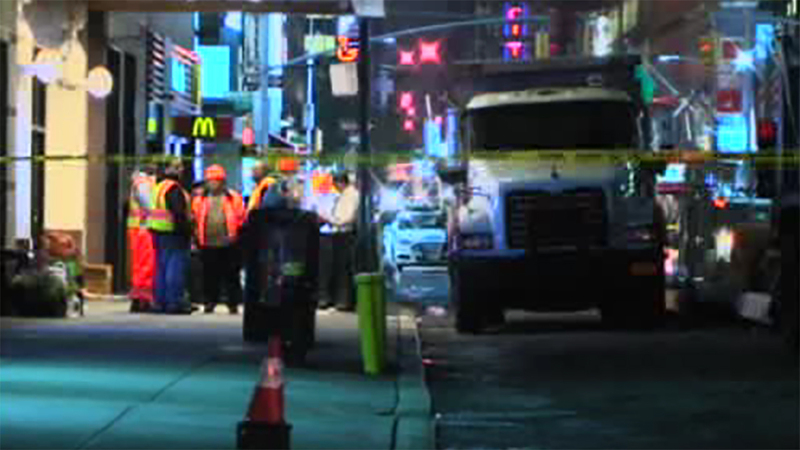 MIDTOWN, Manhattan (WABC) -- A man was run over and killed by a dump truck in Midtown Manhattan after he climbed onto the side of the truck, police say. It happened Monday night on 51st Street between 8th Avenue and Broadway. Police say the 29-year-old man jumped onto the driver's side of the truck, standing on a diesel tank foot rail. The driver apparently didn't know the man was there as he headed to a construction site which contained metal barriers. The man's backpack got tangled up in a metal fence, causing him to fall to the ground where he was run over by the truck's rear tires. The driver is not facing charges.